We've all heard the adage that America is the land of opportunity, yet a more specific location is often necessary for certain types of opportunities to come up. Take the case of Salvatore "Sonny" Bono, who drove a meat delivery truck along Hollywood's Sunset Blvd. in the late 1950s and eventually became a member of the U.S. House of Representatives. Or Cherilyn Sarkisian, a teenager who grew up some 200 miles from there in El Centro and later hung around Santa Monica Blvd. in Hollywood, hoping for a break as an actress. She eventually became a fashion icon and won an Academy Award. Sometime in between the two met, married and became singing stars...and household names. There were some who saw Sonny and Cher as quite the odd couple when they exploded onto the music scene in 1965. Their image, in fact, purposely cast them as outsiders marching to a different beat. Their union was not a lifelong one, at least not on the outside for all to see, but it may very well be they were more right for each other than any two people could ever be. 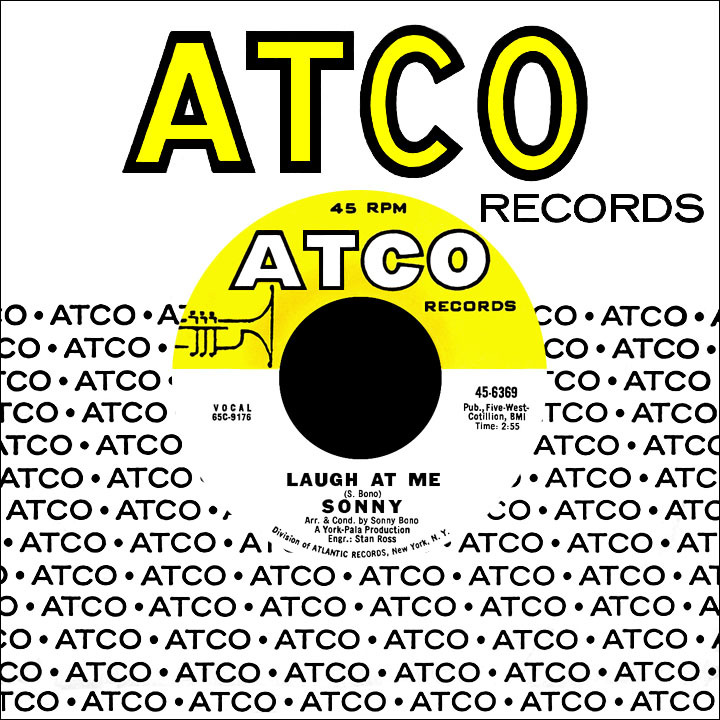 Sonny had started out eight years earlier, trying to convince the record labels along his delivery route that he could write songs, but none were particularly receptive until Art Rupe at Specialty Records gave him a shot. His "High School Dance" (cowritten with Vince Oliva) landed on the flip side of Larry Williams' first hit, "Short Fat Fannie," in the spring of 1957. Working with Williams, he devised a bit of madness called "You Bug Me, Baby," a mid-chart hit for the singer in December 1957, marking Sonny's first bona fide success as a writer. Using the pseudonym Don Christy (after his first wife Donna and daughter Christy), he and Roddy Jackson penned "She Said, 'Yeah'" for Williams; the song gained greater notoriety several years later when The Rolling Stones remade it for the album December's Children (And Everybody's). 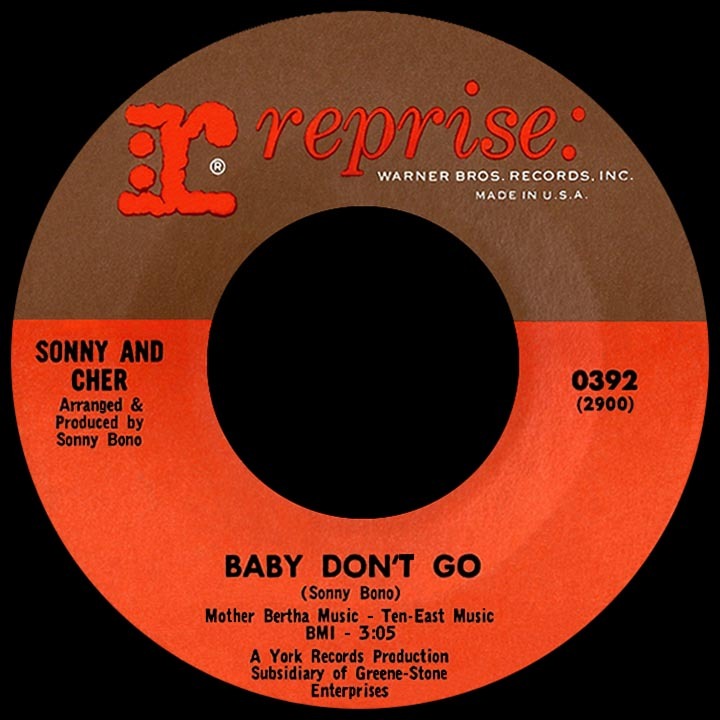 Rupe made Sonny an A&R man for Specialty and he worked with the label's new talent including Don and Dewey; under the Christy name he wrote one of their better-known efforts, "Koko Joe." Later, seeking to establish himself as a singer, he released one single in '59 as Don Christy on Specialty and a few for other labels over the next year or so. He used his own name for a one-shot single on the Highland label around the time he began working with Jack Nitzsche; the two composed "Needles and Pins," a minor '63 hit for Jackie DeShannon (and bigger smash for The Searchers the following year). Jack and Sonny practically lived at the Gold Star studio assisting Phil Spector on his great string of hits; Sonny was basically doing whatever Phil told him to during the 1962 and '63 Gold Star sessions that marked the peak of Spector's producing career. Sonny admitted he was "Phil's flunky" while he assisted with everything - producing, arranging, engineering, singing background and playing percussion, even running errands and bringing Spector coffee when he wanted it. When 16-year-old Cherilyn LaPiere (using her stepfather's surname) started coming around, she quickly caught Sonny's eye (and Phil's and the other men in the vicinity). Spector let her do some backup singing on a few sessions, and she can be heard behind The Crystals and The Ronettes on some of their 1963 recordings. Spector decided to record her solo on a quickie called "Ringo, I Love You," written by Phil with Paul Case, Vini Poncia and Peter Andreoli. Released in early 1964, just after The Beatles had broken wide open in the U.S., she was credited on the single as Bonnie Jo Mason (a name Spector made up) and released on Annette Records (as opposed to his usual Philles label). While a few Beatles-related novelty singles hit the charts in '64, this wasn't one of them. 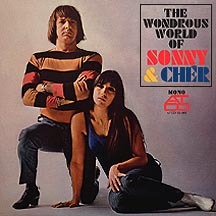 Sonny and Cherilyn, in a romantic relationship at the time she turned 18 in May '64, decided to try singing as a duo and did a session for Vault Records, coming up with yet another fake name, Caesar and Cleo (seeing themselves as a sort of younger Richard Burton and Elizabeth Taylor, starring at the time in the big-budget Cleopatra). "The Letter" (written by Don and Dewey) couldn't get off the ground, yet Phil was encouraging (and simultaneously critical) and Sonny kept pushing, as he had since his days at Specialty. In the fall, he cut deals with Imperial Records (for Cherilyn as a solo singer) and Reprise (to record the two as Caesar and Cleo) while setting himself up with both labels to produce all sessions and write most of the songs. 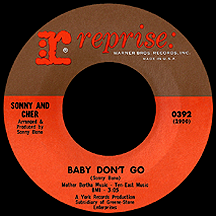 First out was "Baby Don't Go" released as Sonny and Cher, the stage names that would stay in play. 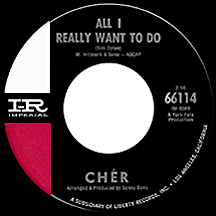 Cher's performance of the semi-autobiographical song was her strongest yet, and it was a top ten hit in Los Angeles at the end of 1964, though it failed to spread beyond Southern California. In a strange homage to the oddly-named instrumental tunes Phil Spector had been backing his single releases with for some time, the record came out with a tune called "Walkin' the Quetzal" on the flip. Next came "Dream Baby" by Cherilyn, a Bono production sounding so close to a Crystals or Ronettes record that it was as if Spector himself had pulled all the strings. The song received a little L.A. airplay and was quickly over. This one had an instrumental ditty called "Stan Quetzal" on the flip, and there were several more Quetzal (which is a colorful Central American bird, by the way) B sides to come. 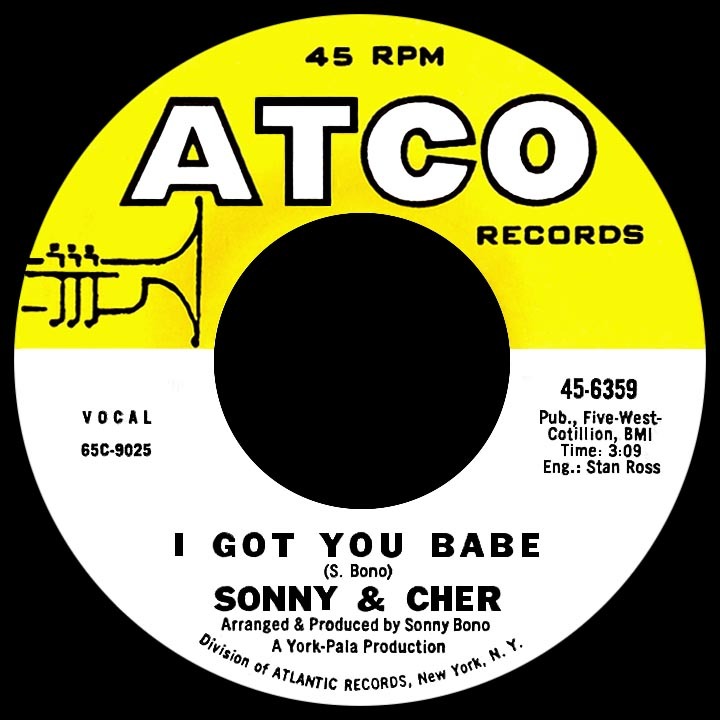 In the spring of 1965, Atlantic Records signed Sonny and Cher to their Atco label and released "Just You." Again, the single was a hit on the duo's L.A. home turf but didn't connect elsewhere. Having shortened the Cherilyn name for good, Cher recorded Bob Dylan's "All I Really Want to Do" for Imperial and it became the record that got her career rolling (simultaneously pummeling a promising version by L.A. band The Byrds in July). 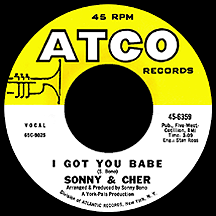 Just one week later, "I Got You Babe," another Sonny and Cher song of undying love, hit the charts on Atco and the two singles were suddenly racing up the charts in a welcome competitive coincidence. Both were number one hits in Los Angeles (first "All I Really" then "I Got You" the following week), while on the national charts Cher's single landed just shy of the top ten while "I Got You Babe," as most are aware, was a monster, spending three weeks at number one in August. That summer was a head-spinning time for Sonny and Cher. Suddenly on a level with the Beatles and Stones (if only temporarily), their uniqueness made them instant superstars. Everyone was talking about this young rebellious couple, he with the Flintstonesque caveman vests and she with the seemingly endless closet full of bell bottom pants (for the next few years, many wondered aloud as to whether she would ever be seen in public wearing a skirt or dress, and wow, did she ever...eventually). 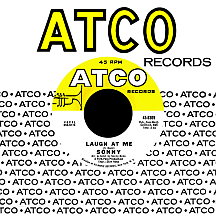 During their chart-topping August rush, three more singles impacted the charts: Reprise rereleased "Baby Don't Go" from the previous year, while Atco reprised with a solo single by Sonny, "Laugh at Me." Both were in the top ten at the beginning of October, while Atco's reservicing of "Just You" hovered just below. In addition, they appeared onscreen that month in Wild on the Beach, a low-budget, black and white ripoff of the popular Frankie and Annette movies. The film's only notable moment was their performance of "It's Gonna Rain" (the B side of "I Got You Babe"). Some of the duo's music had a folk-rock flavor, musically and lyrically in sync with the hot American-bred trend of 1965. With releases on four different labels, Sonny and Cher charted nine singles, together and solo, in the second half of the year, including "But You're Mine" (as a duo), "Where Do You Go" (Cher) and "The Revolution Kind" (Sonny). 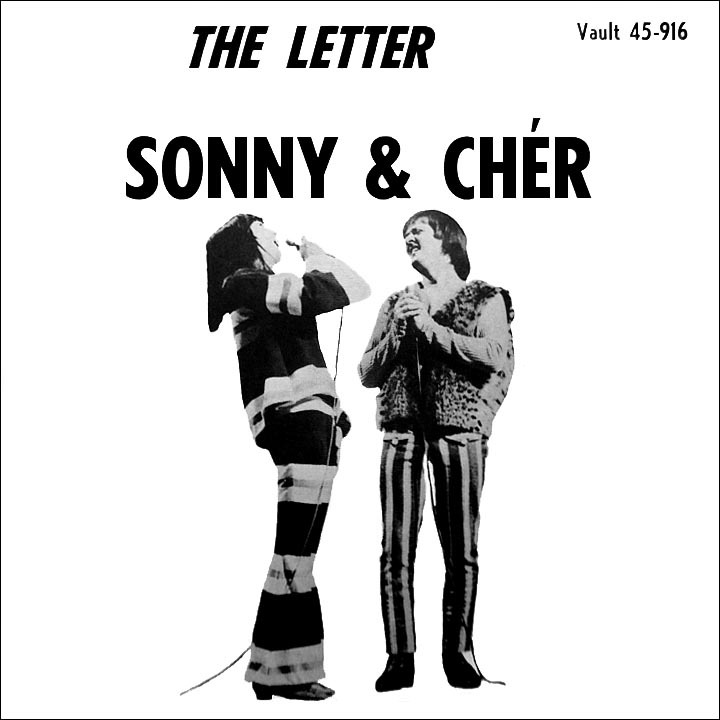 Vault made another run at getting airplay for the earlier Caesar and Cleo single "The Letter," crediting Sonny and Cher on the new pressings. Reprise pushed their own '64 Caesar and Cleo single, "Love is Strange" (an updating of the 1957 Mickey and Sylvia classic), opting to stay with the original C&C credit for reasons that can only be guessed at. At one point in October, the couple (together and separately) had six songs on the national charts simultaneously, a previously unheard-of feat for anyone not named Presley, Lennon, McCartney, Harrison or Starr. "What Now My Love," a French standard written a few years earlier by Gilbert Becaud and Pierre Delanoe with English lyrics by Carl Sigman, got 1966 off to a strong start (for Sonny and Cher as well as Herb Alpert and the Tijuana Brass, who scored a hit with an instrumental version just two months after the duo's release). With New Orleans legend Harold Battiste on board, Sonny and Cher's music began venturing into new and sometimes experimental territory as they sought to keep the momentum going into 1966. Battiste did the arrangements for most of their output over the next couple of years and served as Sonny's most trusted advisor. The highlight of Cher's solo career in the '60s came in the spring of '66 with the number two smash "Bang Bang (My Baby Shot Me Down)." Battiste's arrangement of Sonny's song had an old world European flavor and was the first of many gypsy-influenced selections in her repertoire through the years. S&C used the same approach on "Little Man" a few months later. Cher also hit that year with Burt Bacharach and Hal David's "Alfie," the title track of the film starring Michael Caine. While her original, featured over the closing credits, hit the top 40, a cover of the song by Dionne Warwick was a bigger hit several months later. Their momentum started to slow down by the end of the year, but Sonny had an idea that became "The Beat Goes On," containing the subtle message that no matter what is going on in the world at any given time, 'drums keep poundin' a rhythm to the brain...and men still keep on marching off to war...grandmas sit in chairs and reminisce, boys keep chasing girls to get a kiss...bum still cries hey buddy, have you got a dime?' This bit of discourse put the duo back in the top ten in early 1967; it was their biggest hit together since "I Got You Babe." Sonny and Cher inevitably entered the acting arena with an appearance in a March '67 episode of NBC spy series The Man from U.N.C.L.E., leading into what would surely be major movie stardom with their first (and only) feature-length film together, Good Times, a something-less-than-blockbuster effort directed by William Friedkin (who would redeem himself in the '70s with The French Connection and The Exorcist). Cher did manage another hit record in the flop film's aftermath with "You Better Sit Down Kids," interestingly written and performed from the male point of view (a trick she returned to several years later with "The Way of Love"), but things ground to a halt after that. By the start of 1968 the hits were no more...well, at least until about 200 weeks went by. In the interim, Sonny calculatedly stepped aside and let Cher take a go at the acting career she had dreamed of since childhood. This first solo vehicle for the now singer-actress was "Chastity," directed by Alessio de Paola (who dropped out of the movie industry - and, seemingly, the world - after its release), a somewhat misguided effort wherein Cher's character hitchhikes to Mexico and finds ways to kill time...98 minutes' worth of it. Still, her performance showed promise, and after 13 years she would begin to build on her potential. She became pregnant during the location shoot in Arizona and gave birth to the couple's only child, not coincidentally named Chastity, in March 1969 before the movie's release. The new decade began with the "old married couple" (after all, Cher was 23!) taking to the Las Vegas stage with an act devised by Sonny, ready and willing to be the comic foil to Cher's put-downs, intentionally denigrating his masculinity and apparent lack of brainpower. The whole thing was played strictly for laughs; audiences ate it up and flocked back for more. 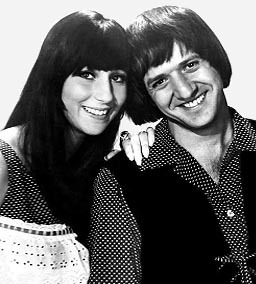 The duo's renewed popularity led to a summer variety show on CBS in 1971, followed by a regular run of The Sonny and Cher Comedy Hour starting in December. They benefited from the TV exposure with a resurgence in hit singles, starting with Cher's chart-topper "Gypsys, Tramps and Thieves," following once again with alternating solo and duet releases including the S&C hits "All I Ever Need is You," "A Cowboy's Work is Never Done" and "When You Say Love." Marital turmoil contributed to the variety series' cancellation at the end of the 1973-1974 season. 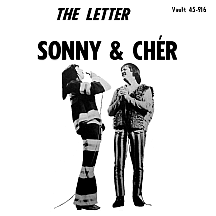 They divorced, after which The Sonny Comedy Revue had a short run on ABC sans Cher, then Cher had a slightly longer run in 1975 sans Sonny. As soon as the Cher show left the air in early '76, they joined together again on The Sonny and Cher Show, the jokes this time making light of their lives apart rather than their lives together. By the end of the run in August 1977, viewers had been following the ups and downs of the Bono and post-Bono family for a full six years.